Posted on October 3, 2010 by Akashic Love & Light! A visit to the village of Chong Kneas is a unique experience not to be missed. Along the way visitors will feel as though they have been transported to another world; farmers with oxen harvest the lush green rice paddy fields that dot the countryside and brightly colored stilt houses rise up from the farm land like rural skyscrapers. This is not a tourist attraction, this is a real village that many Vietnamese and Cambodians call home. Unlike the average community we envision in the states though the residents live in the brightly colored houseboats that bob up and down on the choppy water and worship at the local floating catholic church or mosque. 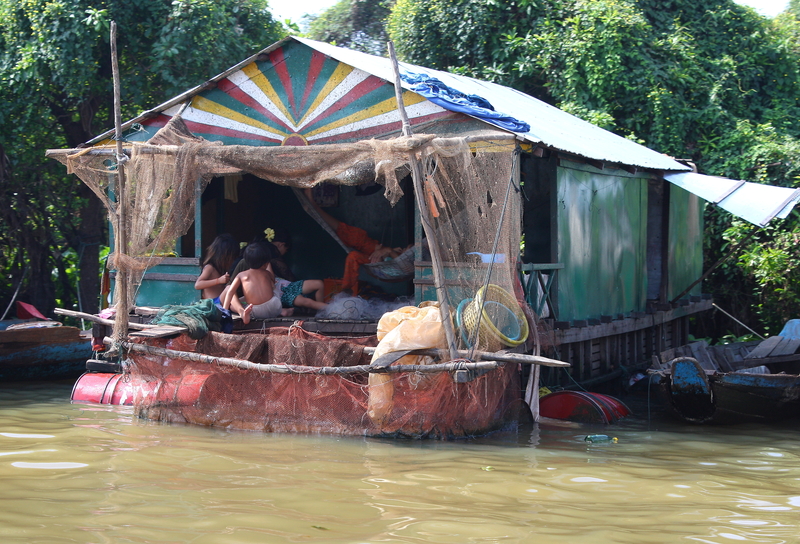 During the week children are sent to school by boat rather than bus to their house-boat school. After their lessons, the children get to play at the large floating basketball court, surrounded by netting so the ball doesn’t fall out into the water. All day motorboats buzz up and down the waterways carrying passengers to conduct their daily duties. Don’t be surprised if a rickety wooden boat flies up selling coconuts and other beverages to tourists. The viewing deck from the floating restaurant offers a great panoramic view of the marine city from above. In the village is the Gecko Environment Center, where you can learn about the conservation of the Tonle Sap River. The floating center offers information on the ecology of the waterways and the fishing industry and other facts about the village. 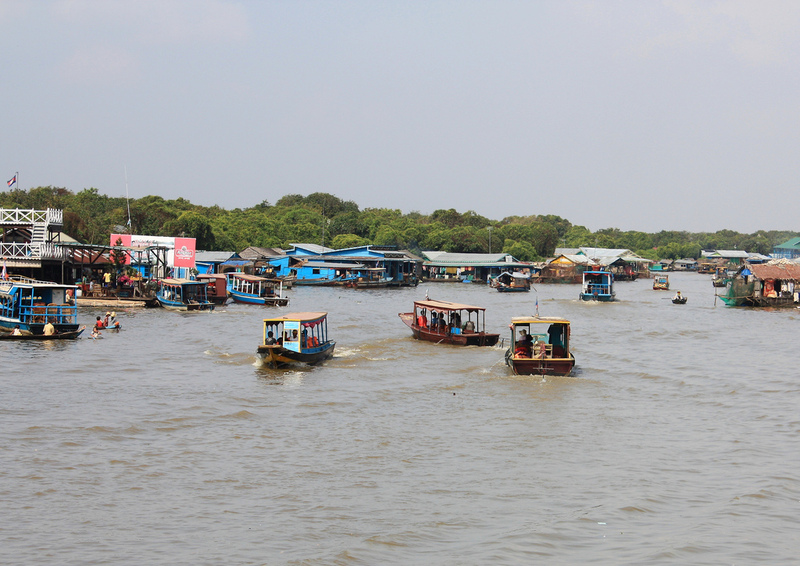 Really the main attraction of Chong Kneas is the 1000 plus brightly colored houseboats that line the waterway. This fairly large community consists of a network of 8 villages that lie along the Tonle Sap water way, migrating with the rise and fall of the water levels. About 6,000 residents live in the villages, mainly of Khmer and Vietnamese origin. Although It sounds charming, life on these waterways is hard. 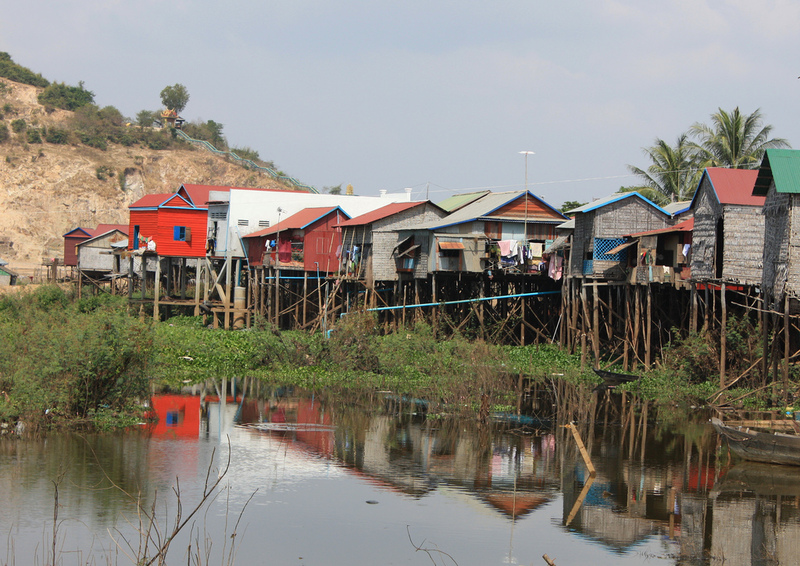 Inhabitants live mainly in wooden house boats, some of the more poor live in makeshift stilt houses you will see out on the shore. Don’t expect too much in terms of tourist attractions, this is a working village where people live. One criticism of visiting the village is that the residents don’t profit too much from tourism, and there is a level of extreme poverty. I did have mixed feelings about my visit. Chong Kneas is about a 30 minute drive outside of the city. The paved road to the village passes through a number of rural villages made up of wooden shacks and brightly colored stilt houses. It is easily accessible by car, tuk-tuk, or arranged tour. It’s best to leave early for a visit as it gets extremely hot in the afternoon. There are a number of options available for getting to the floating village. Tuk-tuks or taxis are readily available to take visitors from Siem Reap to the boat docks. From there it is necessary to make arrangements at the marina for the two hour round trip boat ride. The price to hire a boat is usually $15.00-$20.00 USD. Another option is to arrange for a private tour. As this is a half day excursion, it would be practical to combine this trip with another half day tour. For $75.00 per person, Peace Of Angkor Tours offers an air conditioned car with driver and a guide, private boat, and a half day trip to one of the outer areas of the Angkor Wat Complex. Check with them directly for current prices. Most hotels in Siem Reap are able to make arrangements for a tour as well. 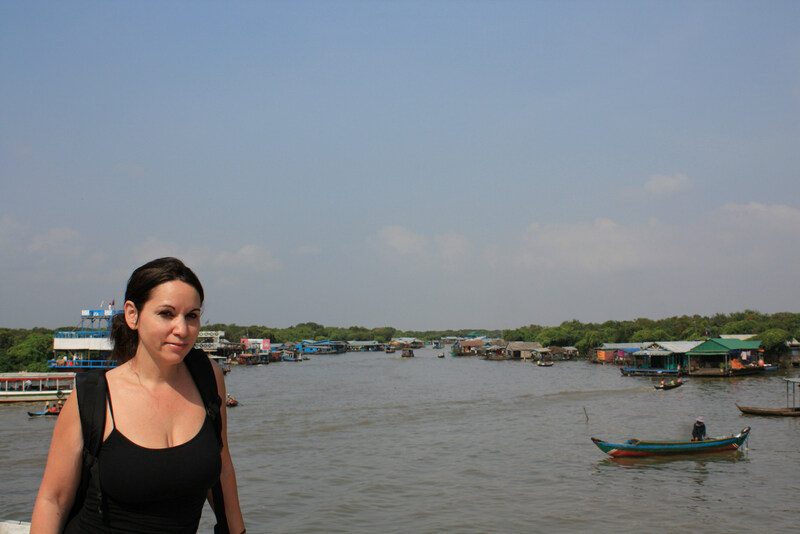 A visit to Chong Kneas is an exciting opportunity to experience the culture and countryside of Cambodia. The colorful houseboats and floating village alone are worth the trip but getting out of Siem Reap and seeing the countryside and small villages is a unique experience in and of itself. This entry was posted in asia, cultural asia, photography, travel and tagged asia chong kneas cambodia, siem reap. Bookmark the permalink.